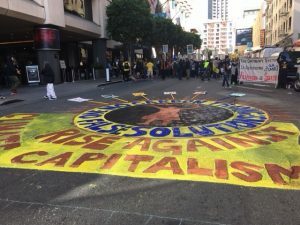 This week, thousands of politicians, scientists, activists and business leaders met in San Francisco to take part in the “Global Climate Action Summit (GCAS)” organized by California’s outgoing Governor, Jerry Brown. Dozens of panels, which included Former Vice President Al Gore and Former New York City Mayor Michael Bloomberg, focused on issues of lowering emissions and adhering to the 2015 Paris Climate Accord. But this was not a one-sided lovefest–the conference was not without its detractors. One environmental organization staged a week-long string of demonstrations to coincide with the summit. However, their ire wasn’t directed toward President Donald Trump—whose policies were derided during the conference. Instead, the protests were staged against Brown, who, at the start of the conference, signed SB 100 into law putting California on track to being carbon-free by 2045. Brown’s climate bone fides have been documented during his tenure as governor. In addition to signing SB 100, Brown promoted and extended California’s Cap and Trade policy and signed legislation that boosted efficiency standards for appliances. He also recently signed a bill that prohibits new construction of pipelines and other infrastructure within state waters if new federal offshore leases are granted, which effectively stymies attempts from the Trump Administration to promote offshore oil and gas development off the California coast. However, Brown has stopped short of ordering a full moratorium on oil and gas development or a ban on fracking in California, which has put him at odds with some environmentalists. 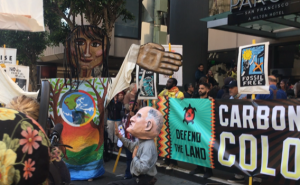 On Thursday, hundreds of demonstrators gathered outside the main GCAS venue, shutting down streets and calling for leaders inside to do more to address climate change. 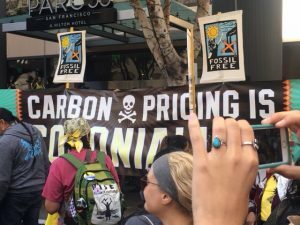 On Monday, with the backdrop of a banner that read, “Carbon Pricing is Colonialism” a group of roughly 200 protesters gathered outside the entrance to Gov. Brown’s Climate and Forest Task Force annual meeting. “We reject these market-based climate solutions and projects such as the reducing emission and deforestation program. Because they are false solutions,” leaders declared over a loudspeaker. The annual meeting being held inside discussed ways that the government, indigenous peoples and private sector can collaborate to reduce deforestation and promote sustainability. Protesters called the priorities of the indigenous representatives attending the meeting into question and expressed their own discontent for not being included in the discussions. “They’ve been lied to by the Environmental Defense Fund, they’ve been lied to by WWF [World Wildlife Fund],” Tom Goldtooth, Executive Director of the Indigenous Environmental Network told the crowd. Despite chants of “shut it down,” in reference to the meeting, group leaders were permitted to enter the building and read the open letter to task force representatives. The group rejected calls for “market-based” solutions to climate change, and instead implored attendees to prevent any further development of fossil fuels. REDD+ is a program conceived under the United Nations Framework Convention on Climate Change and refers to “reducing emissions from deforestation and forest degradation and the role of conservation, sustainable management of forests and enhancement of forest carbon stocks in developing countries.” The framework was adopted in order to reduce emissions from deforestation. Part of the incentivization for hitting specific emissions targets and milestones was the inclusion of a financial mechanism in the form of carbon credits and trading. “We have to tell them, nature is not for sale! Mother earth is not for sale! The sky is not for sale! We are here to defend our future generations of these governments that just want to sign a death sentence, we know you are siding and wheeling and dealing with those carbon traitors, but nature is not for sale,” leaders told the crowd. The implementation of a carbon pricing scheme was featured heavily in several of the GCAS mainstage events. The idea is championed by the Environmental Defense Fund, who, alongside representatives from the governments of California, Canada and the European Commission hosted a daylong event on its merits. At one point, protesters staged a conversation between “Mother Earth” and Jerry Brown in a short skit. The skit concluded with Brown kneeling and asking for forgiveness. The divide between environmental organizations was also on display, with Sol2Sol presenters bringing to attention the financial disparities between groups that were represented inside the Task Force and Climate Summit, and those relegated to the sidelines. GCAS’s website lists Bloomberg Philanthropies, the William and Flora Hewlett Foundation, Next Gen Policy, ClimateWorks, Sea Change Foundation and The Rockefeller Brothers Fund as major sponsors of the event. Combined, the endowments of these groups top $1.2 billion.